Baylor’s Chloe Jackson made a driving layup in the final seconds to give the Lady Bears a two-point lead in the national championship game in Tampa. After calling time out, Notre Dame inbounded the ball at half-court to Arike Ogunbowale, who was fouled on her drive to the basket. The hero of last season’s Final Four had two free throws to tie the game and send it into overtime, but she missed the first and Baylor won the game and the championship 82 to 81. "Really frustrated. I'm sad for the seniors that we came that close after getting down 17, clawing our way back," Notre Dame head coach Muffet McGraw said. "We had so many missed opportunities on both ends of the floor. Defensively, the offensive rebounds we gave up just really lost us the game in the first quarter. We just didn't come out ready. That was disappointing. I thought (Baylor's Chloe) Jackson really was the key to the game. We really couldn't guard her. (Kalani) Brown gave us a lot of trouble, as well. Those two really played well." "It was a great season," McGraw added. "It was certainly a great career for Arike, Marina, Jess and Bri." The Irish fell behind 25 to 14 in a miserable first quarter. ND was 5 for 24 from the field (20.8%) after starting the game 1-16. Ogunbowale was 2 for 9 in the first ten minutes. Baylor made 12 of 18 shot attempts (66.7%) in the first quarter and 7 of its first 10. The Irish fell behind by 17 points in the second quarter before battling back to play Baylor even in the second and third quarters. Baylor made last-second shots in each quarter of the game. After the Irish trimmed the lead to 7 with four minutes left in the third quarter, Baylor pushed the lead back to 14 before a last second three-point basket by Ogunbowale cut the lead to 11 heading into the final quarter. ND opened the fourth quarter on an 8 - 0 run, which got started when Marina Mabrey was fouled on a three-point attempt and made all three free throws to cut the lead to eight. Mabrey tied the score at 74 on her third three-pointer of the quarter with a little over 5 minutes remaining in the game. The game see-sawed back and forth with the Irish going down by two, up by one, down by one, before tying the game when Jess Shepard made one of two free throws with 48 seconds left. Jackson gave Baylor a two-point lead thirteen seconds later, and Shepard sank two free throws to tie the game at 80 with just seventeen seconds left. Jackson scored again on the next possession to give Baylor a lead they would not relinquish. The last-second dramatics may not have happened if Baylor’s star forward, Lauren Cox, had not suffered a devastating knee injury with a little over one minute left in the third quarter. The 6’4” Cox paired with 6’7” Kalani Brown to stifle the Irish offense possession after possession. Cox had three of Baylor’s eight blocks and her presence altered Irish shots until she had to leave the game. 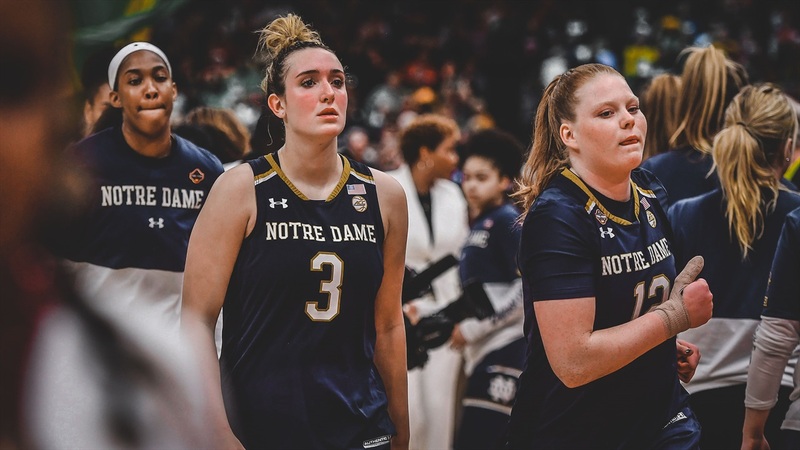 Even without Cox on the floor, the Irish still needed to make shots to come back, and Mabrey, who had been in a shooting slump throughout the NCAA tournament, came up big when her team needed her the most. She scored 12 points as the Irish tallied 19 in the first five minutes of the quarter. The Irish could only manage 7 more points the rest of the way and missed their final five shots from the field and two crucial free throws in the final minute. The Lady Bears only made 4 of their last 12 shots from the field after the Irish tied the score at 74, but two of the makes were by Jackson in the final 35 seconds. Jackson, a graduate transfer playing her first season at Baylor, was her team’s top scorer with 26 points and was named the tournament’s most valuable player. Brown scored 20 points for Baylor (10-16 from the field) and collected 13 rebounds. NaLyssa Smith came off the bench to deliver 14 points in just 17 minutes of playing time. She was 7 for 9 from the field. The Irish out-rebounded Baylor 43 to 38. Shepard had 10, Brianna Turner 12 and Jackie Young 9. Shepard was 4 for 10 from the field and Turner was 4 for 11. Both made over 60% of their field goals throughout the season, but were stymied time after time by Baylor. Young only made one field goal — in the first quarter. She finished 1 for 8 from the field and 2 - 2 from the line for 4 points. Mabrey finished with 21 points. She was 4-8 from three and 3 for 3 from the line. She had three assists for a total of 171 this season and an even 500 for her career. She finished with a career total of 1,896 points. She shot 40.8% from beyond the arc this season. Ogunbowale scored 31 points, including 3 for 5 from three. She was 6 for 8 from the line. She extended her Notre Dame best in career points to 2,626. Mabrey and Ogunbowale were named to the All-Final Four team. The five starters finished with a combined 10,230 points. The four seniors will now await this Wednesday’s WNBA draft. So might Jackie Young. The junior has less than 24 hours to decide if she will declare for the draft or return for her senior year.